If you follow trends like I do, you would have seen this one coming ‘a mile away’. We started with Boyfriend blazers, then military blazers, and now we see the influx of Bold colorful blazers for 2010. Solange Knowles and Queen Latifah both hit up Superbowl parties and events wearing this new trend. Solange, who is all about color, wore a neon leopard print blazer with a bandage skirt on her first night in the MIA and then switched to a boxy color confetti creation at the Tide/Febreeze event during the weekend. She kept everything basic on the bottom. Check the KILLER platform pumps she rocked all weekend. I’m loving this look. 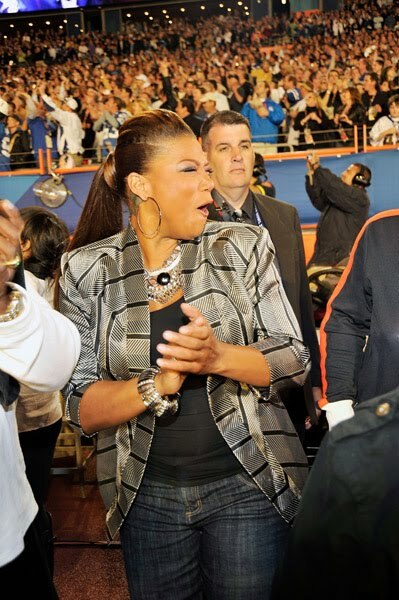 Queen Latifah went for classic and age appropriate with a angular cut old stripe pattern blazer, heavy metal jewelry and jeans as she stood on the sidelines for the Superbowl. Her outfit shows you can do this trend to fit your look and the occasion. AND, we all know the Queen is plus-size so she wasn’t afraid to wear print on her frame. It looks good. I’ve assembled some bold blazers for you to purchase (above). Click the box to get pricing for you new trend. Add some color to your wardrobe this spring.